Upper structure triads are very useful for bringing new elements in your comping and single note soloing. Triads are ideal for comping because they are easy to finger and most of the time don't contain the root of the chord (which is played by the bass player). On this page you'll see which upper structure triads work best. These guitar chord substitutions open up new sounds and give you fresh ideas. the upper structure triad must contain at least one tension which is not an avoid note. Avoid notes only play a role in major chords. An upper structure triad can be major, minor, diminished or augmented. For me major upper structure triads work best. You can use upper structure triads for soloing as well as for comping. Triads are technically non complex chord forms, but in combination with a bass player they can really open up your sound. The first upper structure triad in the list is for a major chord type. V means we build the upper structure triad on the 5 (compared to the root) of the chord. V- means a minor triad on the 5th note. V+ means an augmented triad on the 5th note. bVII means major triad on the b7. What is a good guitar to play jazz? 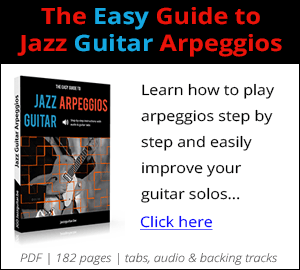 What is the best jazz guitar amp? How do I mix jazz and blues? What are guitar modes and how can I use them? How can I play gypsy jazz guitar in the style of Django Reinhardt? What are arpeggios and how can I learn/use them? How Do I Play the Chords of Take the A Train? What is the bebop scale and what can I do with it? How to Play Blue Bossa?